Adafruit and Digi-Key have teamed up to support a great cause, Girls Who Code. We’re a national non-profit organization dedicated to closing the gender gap in technology. 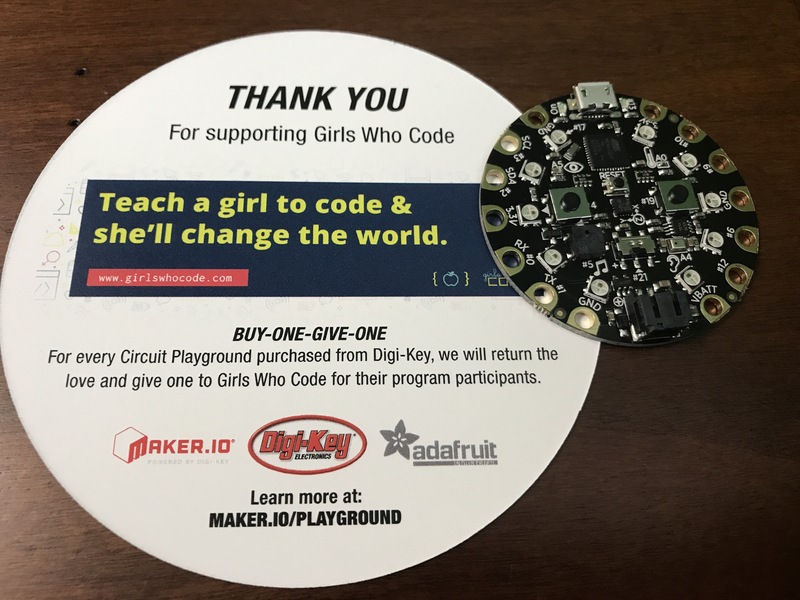 For any purchase of a Circuit Playground Classic from Digi-Key, they’ll donate one to Girls Who Code. At only $20 the Circuit Playground Classic is a really neat board, packed with goodies. With so many features, Circuit Playground is a perfect board for someone learning to program. There are endless possibilities for fun projects. I ordered one to support the program. I’m hoping they’ll get some of the new Circuit Playground Express boards in stock and extend this promotion to those because I’ve been tempted to get my hands on one. If they do, I’ll gladly place another order.